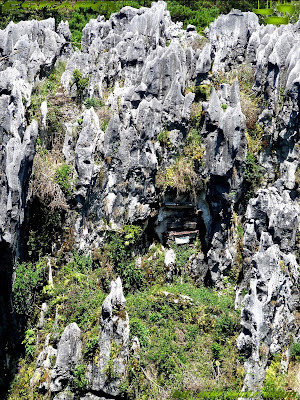 the burial coffins outside Lumiang cave is believed to be more than five hundred years. 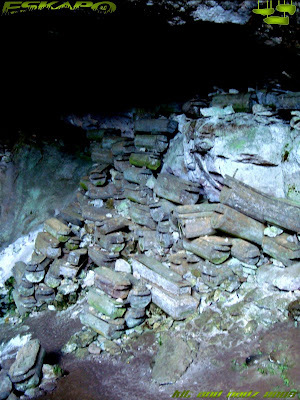 there's about a hundred wooden coffins all piled up in the opening of this cave. early morning the next day, we went to the tourism office at the municipal hall to meet with our guide for the cave connection. 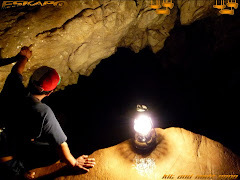 cave guides are certified to be trained and has good experience in the field of spelunking. we were introduced to Manong Wilbur Timpac who has been entering these caves for more than 15years now. a quiet yet compose type of person now on his thirtees. 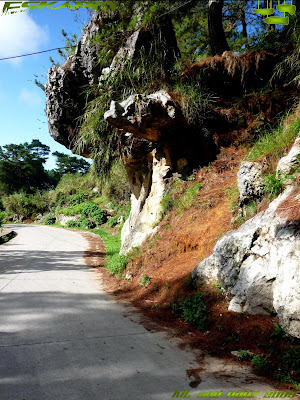 he led us down the paved road to barangay Ambasing, where some of the burial caves are found. even along the road, we passed by small caves with burial coffins outside its opening. towering stone walls can be seen from afar with some hanging coffins, which i'll be featuring in the coming posts. pine trees are everywhere and and the farther we go, the fewer the houses. 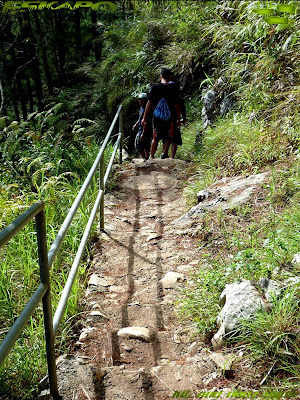 when we reached about 500meters of walking, we turned left now entering a rough path. 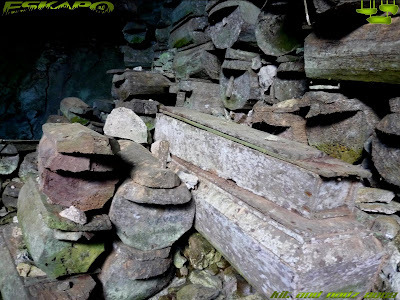 upon reaching the cave's opening, we saw the coffins piled up almost reaching the cave's curved ceiling. 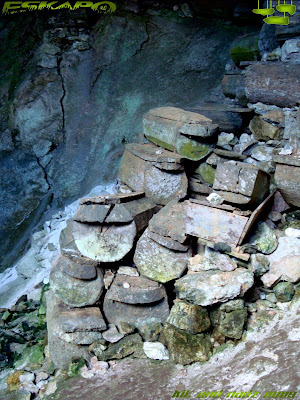 years back, the tribes that inhabited Sagada practiced the tradition of placing the coffins of the dead outside a cave opening instead of the traditional human burial. 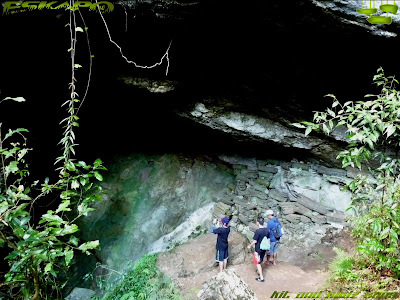 it is not even placed inside the cave as they believe that the dead deserves to be exposed. if you look closely at the wooden coffins, you'll notice that it's smaller than the usual coffin. this is because the bodies are placed in fetal position. in the belief that since the baby in the mother's womb is in this position, humans are to be in the same position when buried. 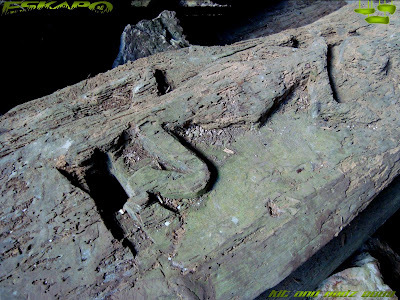 some of the coffins has animal carvings, of which a form of a gecko is common. according to some, this represents good leadership among the clan. 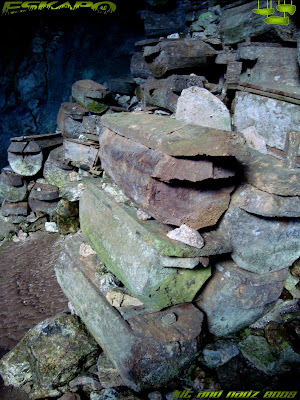 all the coffins in Lumiang cave are believed to be people coming from the same clan. therefore others are placed on other caves around Sagada. 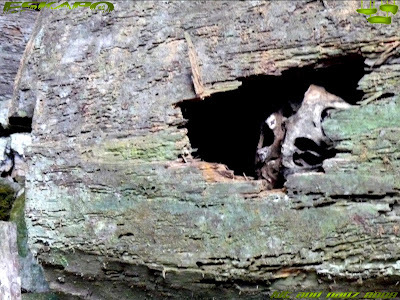 some coffins are already damaged through time. 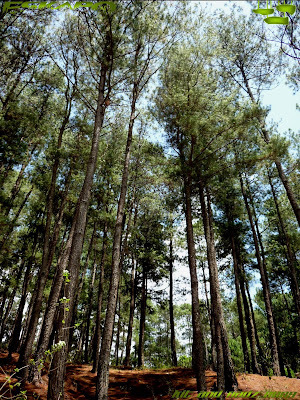 but for years of preservation, the coffins are now being protected and safeguarded by the guides through the initiatives of Sagada's cultural preservation team. i consider this site as a national treasure. Hi Dong ho! ooo hanging coffins? Never seen that before. Fantastic snaps. Each one better than other. i always want to go there to actually see the hanging coffins but even if i will not be given a chance to go there, at least parang narating ko na din because of your posts. ito ba yung kuha ni kit? by the way, really sorry i wasn't able to join you this weekend, something came up kasi eh. kwento ko na lang sa bro next time. thanks ulit dong!! 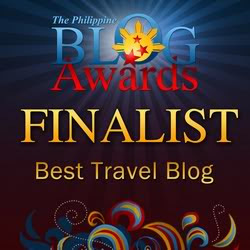 hehe nilagay na kita sa blogroll ko para makabalik ulit ako dito hehe!! Do they have records if people then preserved their dead before burial? as usual great pics. ganda rin ng header! 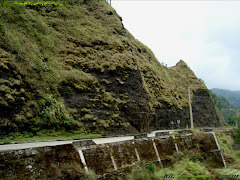 Ganda talaga ng mga photos mo at ang ganda ng Sagada. 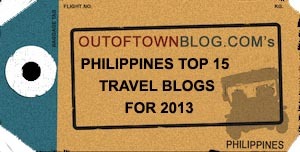 Thanks for sharing this info sana makabisita rin dyan. Wow it looked so scary and eerie. I think they have the same practise in China too but I never see any hanging coffins before. Not sure if I dare to take photos of them..lol. You are so brave. It is really a lifetime adventure for you. Amazing. does it smell anything like cadaver-ish or something? 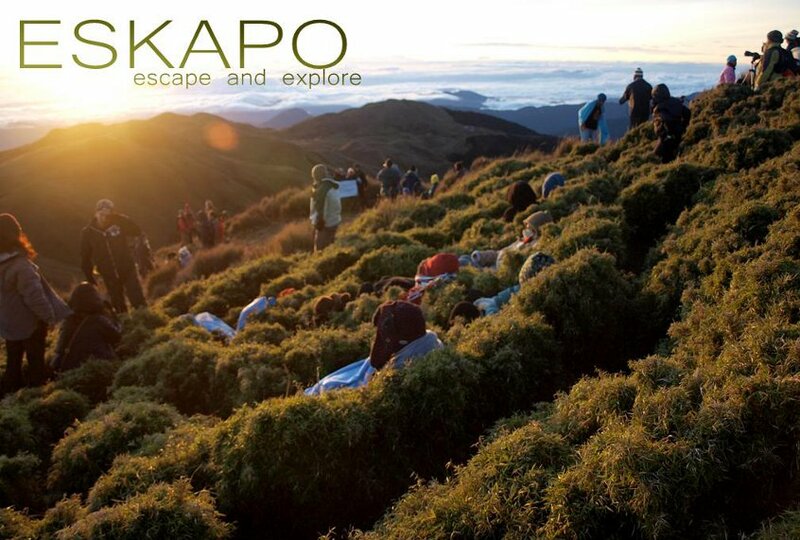 you're really making me want to go to sagada. oh long weekend ahead! 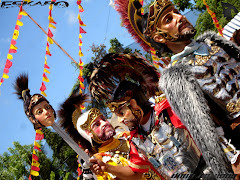 its good to hear that the coffins are now safeguarded,. 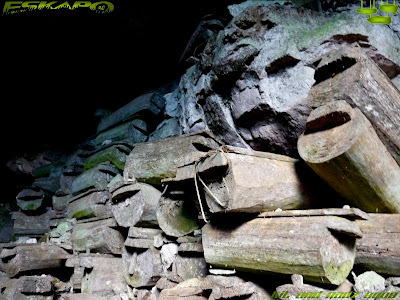 before i read something about archaeologists and treasure hunters would steal coffins and stuffs from the cave,. How very interesting, Dong! I didn't know about the hanging coffins before. Thanks for sharing this. So when will you share your free gift cheques from Krispy Kreme? I'd love to try a couple of donuts while I'm in Manila in the next two weeks. Hi Dong, these are awesome pictures. I thought I have seen these on (MGB) but I guess not as much as you have showed us. 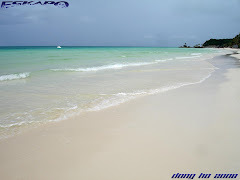 swesome place. Love the rock formations. Gusto ko pictures ng mga puno. Super ganda. Nature na nature talaga. hehe. That was fascinating, eerie, and humbling. I wish those coffins could talk! very interesting. i love those rocks. Definitely a national treasure but more so a spiritual sanctity that deserves respect from all "visitors". Very historical posts, and the photos are a great updates to the ones I've seen years ago from various magazines. Dong, i found this post interesting. 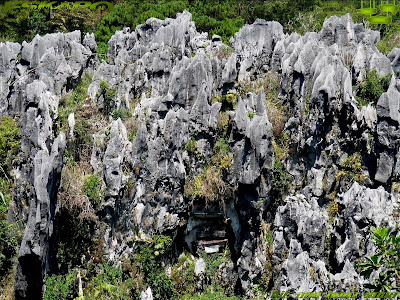 Here in Sarawak we had burial poles n remains up high. Even in my hometown Sibu, the Chinese are buried above ground until today unlike in West Malaysia where they r buried six feet under. hanging coffins? meron palang ganun. 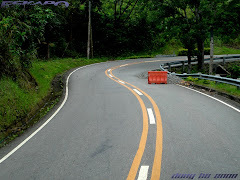 hindi ba nakakatakot kapag andoon ka sa place na yon? thanks for sharing this with us dong. Wow!!! 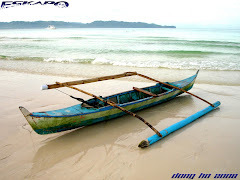 Hanging coffins na naman... I'm glad pinasyal mo kami dito. 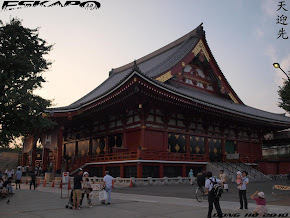 I came across this place in some other blogs and learned that at some points, those hanging coffins were vandalized by irresponsible tourists. I'm sure you would also blog about it later. Wow! Amazing! But I will never, ever walk in this place alone even if it's broad daylight. But this is a good post Dong. Very educational! Can't wait for your next post. You promised hanging coffins, right? Well, bring it on! wow! you never stop to amaze me dong with your photographs, your post. thumbs-up here! 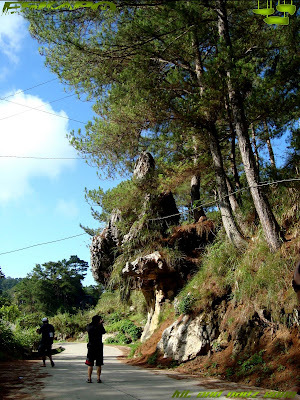 kakaibang pakiramdam, how much more to see by my eyes the mystic Sagada. Ito ba pinuntahan ni GMA? basahin ko 'to mamaya. haha. dream ko pumunta dyan. Did you get that creepy feeling when you were inside the cave? Beautiful photos as always. feeling ko grabe yung lamig dun. So I'm right. 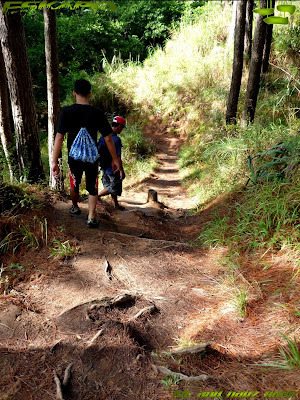 Sagada is not your ordinary Philippine destination. Fascinating. And a bit creepy I must admit. buti napreserve pa rin. kakaibang experience 'to. 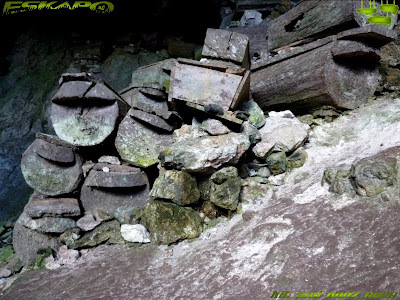 There were reports before of theft in this cave but I wonder now how these coffins are protected from vandals. Do they have guards or padlocked gates? Hey, is it okay if I get your email? I have something I have to share with you. Its something about photography and you might be interested. Oh, I think my link on your blog doesn't work because there is an 's' on it. di ba nakakapangilabot maggala dyan? Whoa, I'm surprised they didnt disintegrate.. It looks like National Geographic to me! Fascinating practice. 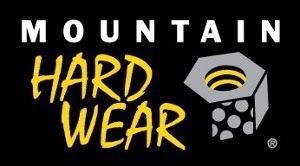 And those rock walls are fabulous! Great shots. Those hanging coffins are amazing. It's great to know that more efforts are being done to protect and preserve them. gano pala kalamig dyan, dong? I enjoyed your sagada series! I'm glad that there are efforts to preserve the hanging coffins. Was always worried about vandalism and looting, i bet some collectors are eyeing those precious artifacts kase.